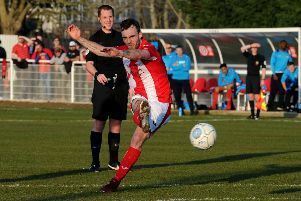 Banbury United bowed out of the Buckingham Charity Cup despite Tuesday’s semi-final second-leg victory over Buckingham Athletic. Top scorer Leam Howards grabbed the only goal - his 21st of the season - at Spencer Stadium but it wasn’t enough for the Puritans to overturn the 2-0 first-leg deficit as the South Midlands League Division One outfit booked their place in Monday’s final. Howards broke the deadlock just before the break to give United a boost for the second half but they couldn’t find the second goal to level the tie on aggregate. Athletic now meet Olney Town in Monday’s final at Stratford Fields after they turned around a 2-1 first-leg deficit against Buckingham Town to go through 7-3 on aggregate.